A fast chain of events is unfolding in Iraq, complete with fierce battles, questionable characters and panicked diplomacy. This story is much more than politics, history or religion, and yet it can only be understood in a historico-political context and under a religious narrative. In this game of thrones, there are no winners. The losers, however, will be the Iraqi people. Last Tuesday’s assault on Mosul, Iraq’s second largest city, by a group of about one thousand fighters, was met with no resistance from the 15,000 strong Iraqi army that left its heavy vehicles, weapons and uniforms behind. The next day, those same fighters took Tikrit, the birthplace of both Saddam Hussein and Salahuddin Al Ayoubi. 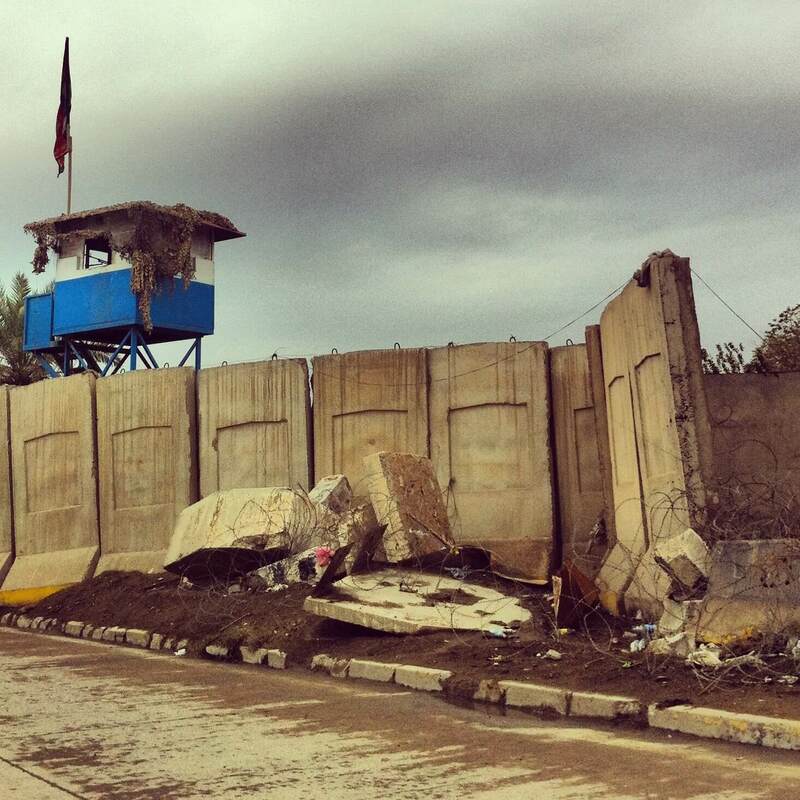 Barricades around the Republican Palace, Baghdad, in 2012. To gain a better context, we must go back to the US invasion of Iraq in 2003. Remember when George W. Bush flashed a smile and a thumbs up with a ‘Mission Accomplished’ banner behind him? The idea was to ‘install democracy’ by placing a puppet government that was divided along sectarian lines to maintain a weak government and keep America’s corporatocracy happy. What resulted was an Iranian proxy sectarian government, bolstered by an army formed from Shiite militias loyal to those same Iranian influences.The next 11 years saw those militias wreak havoc on large parts of the civilian populations in Iraq, in some cases shifting the demographics of sectarian makeup in cities across central and southern Iraq. Baghdad is a perfect example, where Sunni civilians were forced out of several suburbs through intimidation, arrests, torture and, sometimes, murder through sporadic bombings and similar retaliations. Meanwhile, north west of Iraq lies Syria, four years strong into a rebellion against Bashar Al Assad. Another political anarchy polarised on religious and sectarian grounds, Syria’s rebel factions are made up of Sufis, Salafis, super Salafis, nationalists, and everything in between. The name you keep hearing is ISIS (Islamic State of Iraq & Syria). They are framed as the big, bad, massacring, heart-devouring boogie man. Who are ISIS? Are they heralds of Khilafa? Are they takfiri khawarij? Are they Saudi funded? An Iranian False Flag? Are they all of the above? It really depends on who you talk to and their dog. Political or religious ideologies play a large part in how they are seen and described. It is important to understand, however, that ISIS is not the largest player here by far. Rather, the players are a large and diverse mix of Iraqi tribes (who were already involved in minor revolts against the government), ex Iraqi government elements and other Islamist factions who also came out of Syria. 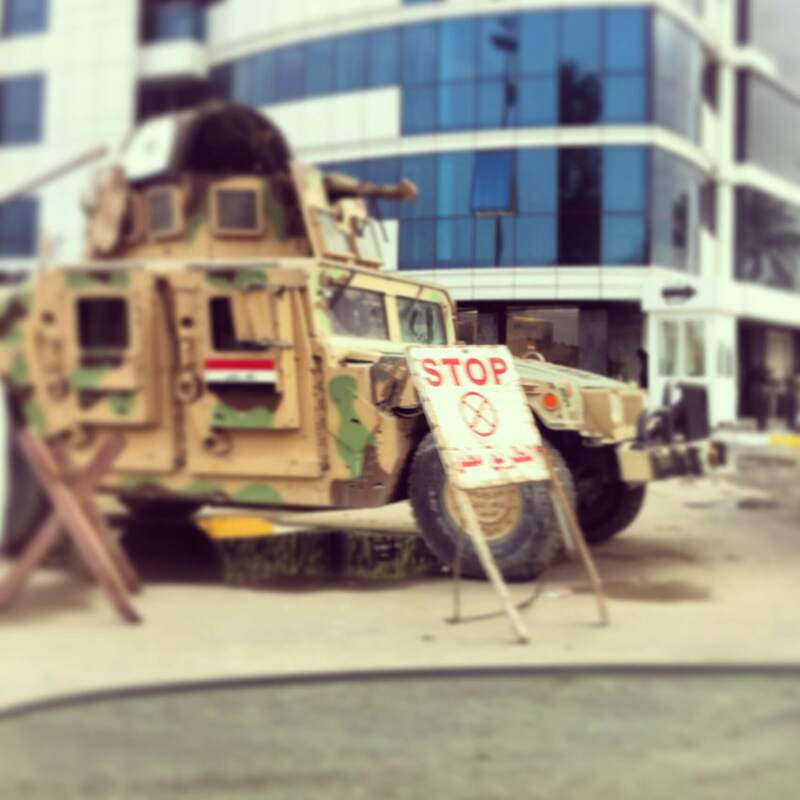 Tanks to slow down traffic at the check-points placed around Baghdad, 2012. Mainstream Western media (remaining ever so impartial) made the ISIS claims early on. The Maliki camp called on Iraqis to take up arms against the “foreign instigators” and, in a fit of panic and shame over his army of deserters, Prime Minister Nouri Al-Maliki has called upon the help of both the US and Iran. In response, Iran sent troops into Iraq in a bid to halt the advance towards Baghdad. So, why did the brave Iraqi army that cost millions of dollars to train and equip make like a tree and leave? Well, it seems they were not really trained as a conventional army. Many of them mostly terrorised civilians and suppressed protests; at the first sign of an actual wartime scenario, they showed their true colors. Just as important to note is the fact that the people of Mosul and Tikrit have, by and large, welcomed their saviours with open arms. Such was the rejection and hatred of the central government in Baghdad. The newcomers seemed keen to return life to normal. Two days later, Facebook and Twitter posts by the people of Mosul showed life returning to relative safety and security. In a surreal fusion of old and new ways, many of the fighting factions have official Twitter accounts and are employing several hashtags, including one that should cause much alarm: #?????_????? ?, that is, Settling the Score. This tag is referring to an expression of revenge over the last 11 years of humiliation at the hands of the staunchly sectarian central government, and the declared intention after capturing Baghdad to move towards Karbala. The taking of Mosul (and Tikrit, and Baji, and by the time you read this article, maybe Samarra or Falluja, or even Baghdad) has sent shockwaves around the world. In the following days, war rhetoric will steadily increase from both the Iranians and the Americans. Several White House press releases have expressed serious considerations of airstrikes in Iraq and Syria. Iran has sent troops over the border into Iraq in a bid to stop the fighters closing in on Baghdad. If I’d told you fifteen years ago that the president of Iraq was going to ask the Iranian military to quash an uprising in Mosul, you would have laughed me out of the bar. And yet now, there is even talk of a clandestine cooperation (diplomatically, if not strategically) between Iran and the US over their shared enemy. 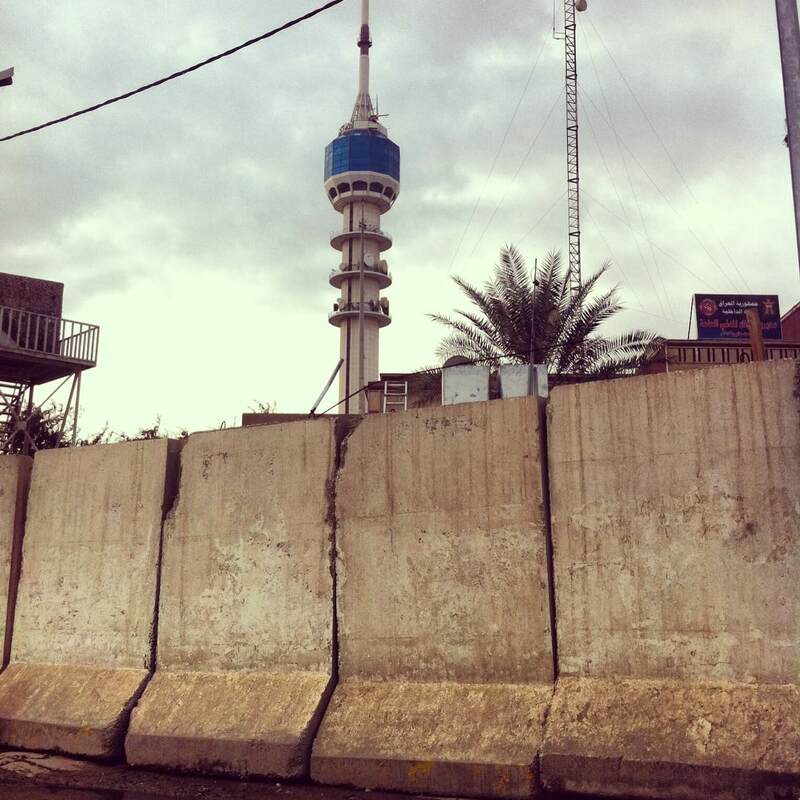 Barricades around Baghdad Tower in 2012. The Maliki government has also arrested hundreds of Sunni men and youth in the suburbs of Baghdad to preemptively foil any possible internal revolts. In a strange and alarming indicator of how bad things are likely to get, sectarian tensions are crystallising at the highest levels. As some religious leaders called upon their adherents to take up arms against the forces in the north, others have called on all parties to avoid fracturing Iraq along sectarian lines by steering away from divisive language and sentiments. Over the next few days and weeks the situation will remain volatile and violence will inevitably increase. As the various stakeholders scramble to take control, civilians will continue to be displaced, escaping from city to city and town to town in a sad reenactment of the 2003 invasion and the 1991 assault on Iraq. The events unfolding in this post Arab-Spring Middle East of holy wars, and shifting political alliances, are infinitely complex. Each side will move brutally and quickly to outplay, outmanoeuvre and outgun each other to maintain strategic control in Iraq. The same Iraq once described by the US State Department in 1945 as “a stupendous source of strategic power, and one of the greatest material prizes in world history… “. One thing, however, is certain. Death will cross the sectarian divide and touch every Iraqi family. One thing should be said that one does not need a sizable army to take control of a city. One more thing also should be said about the whole Sunnies being oppressed, “The Maliki government has also arrested hundreds of Sunni men and youth in the suburbs of Baghdad to preemptively foil any possible internal revolts.” This statement is half true. The Maliki gov arrest anyone who do not agree with them whether sunni, shia or christian. One more thing should be said about this is a uprising about being oppressed by the central gov. This narrative is historically self fulfilling prophecy. If he looked at the first two yrs of occupation, you see that even under extreme sectarian violence by sunnies, shias barely retaliated. This was mostly due to Sistani. Sunnies reasoning was to destabilize the emergent government because if that happens they will be oppressed. Iraq is not like this because of Iran or America. majority of the responsibility of current situation lay on the Iraqi people. First with the tribal Sunnies for not realizing that the only way forward was to regroup politically and national reconciliation. Then with them again for turning the blind eye to foreign fighters that flooding Iraq out of the paranoia of shias. Then with Shia who gave in to the violence and came to match it with brutality. And Kurds are not without guilt in here as well.